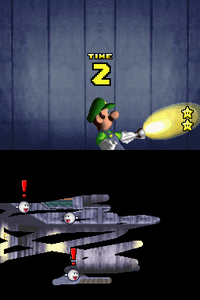 Hide and Boo Seek is a minigame in Super Mario 64 DS and New Super Mario Bros., where Luigi must use his Flashlight to find the Boos in the mansion. While Luigi is the playable character, this minigame is considered a Yoshi minigame in Super Mario 64 DS; it is a Puzzle minigame in New Super Mario Bros.
2.2 New Super Mario Bros. The player must use the as a flashlight. In the intro, the player sees the Boos. The lights then turn off and the player then must find the Boos in the dark in three seconds by rubbing the Touch Screen with the Stylus to find the Boos. If the player finds all of the Boos, the next level starts, where more Boos are found. After level fifteen, the amount of time gets reduced by one second. If the player can't find all of the Boos in a certain amount of time, they lose the game and get a Game Over. The Boos in the game follow basic physics, bouncing off walls and each other at angles relevant to the angle they hit them at. By observing the Boos at the beginning, the player can predict where they end up. In the minigame's multiplayer version in New Super Mario Bros., there are more players and more Boos. Players have fifteen seconds to get as many Boos as possible. When all of the Boos are found, all of the Boos are counted and a new round begins. When the timer reaches zero, all of the Boos that have been found are counted, and whoever has the most total wins. Rub the Touch screen where the Boos are hiding! For the first 15 levels, you get 3 seconds to find them. After that, you only get 2 seconds. Rub the Touch Screen where the Boos are hiding! Can you find them all before time runs out? This page was last edited on December 3, 2018, at 02:20.